A town in Rhein-Hessen (Germany), on the Setez. While the first traces of the residence of Jews in the Palatinate, to which Alzey belonged from the time of the Emperor Frederick Barbarossa, date from the beginning of the thirteenth century, no date is given for the first settlement of Jews in Alzey itself. The name of the congregation appears for the first time in the "Martyrology" of Nuremberg, where it is mentioned as one of the places which suffered in the dreadful persecutions of the year of terror, 1349. The first reference to members of the congregation dates probably from the year 1383, where a certain Bonifant and his wife Jütte, and a Jew of the name of Lassarus, are mentioned. The congregation never played any very conspicuous part in history, and the number of its members until the beginning of this century was very small. The Jews of Alzey shared the unhappy fate of their persecuted brethren in the Middle Ages; at one time they were expelled from the town, at another residence therein was permitted them, all according to the inclination of the Count Palatine of the day. From the year 1391, when the Jews were driven from the Palatinate by Count Ruprecht II., they do not seem to have returned to Alzey for several centuries, or at best only temporarily; for in the census of the year 1550, which registered the names of all Jews living in the Palatinate, none are mentioned from Alzey, although this town was the official center where limited passports were issued at a fixed tariff to all Jews who traded in the region. It is only toward the close of the seventeenth century that Jews again appear in Alzey as a regular congregation. Until the year 1791, religious services were held in private houses. The first synagogue was built in that year through the liberality of Elias Simon Belmont. A census in 1722 enumerated nine families in the congregation, and sixty-three families in the whole district. Twenty years later there were only eleven in the congregation. In 1748 the elector Karl Theodor set the legal limit of families in the town of Alzey at three. He added, that "since there were already more than that number, no additional families would be allowed to settle there until the number had been diminished by death to less than three." From the end of the eighteenth century the congregation grew steadily; in the fourth decade of the nineteenth century about fifty families are found, and there are now (1901) seventy-five. Of the 6,500 inhabitants of Alzey, about 320 are Jews, who devote themselves mainly to mercantile pursuits. The present synagogue was consecrated in the year 1854. The first rabbi (in this new building) was Dr. Samuel Adler, son of Isaac Adler, rabbi of Worms. 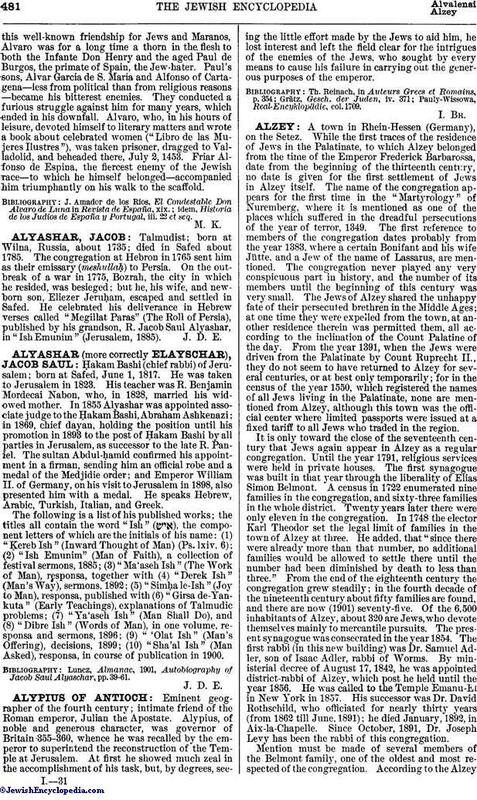 By ministerial decree of August 17, 1842, he was appointed district-rabbi of Alzey, which post he held until the year 1856. 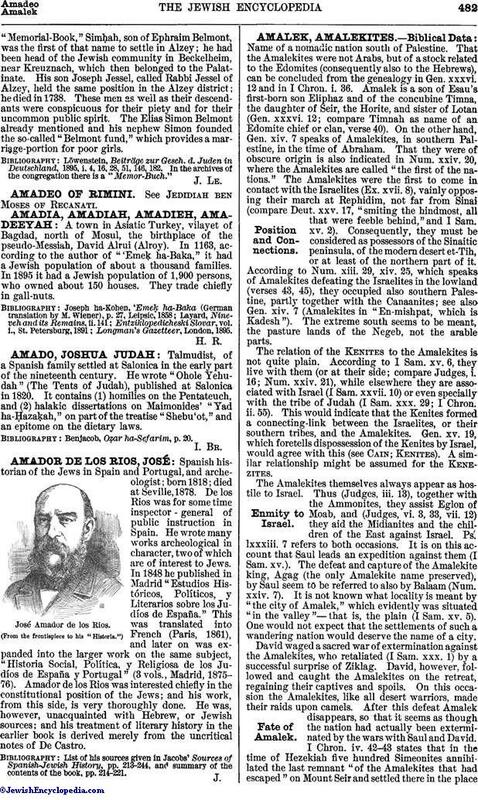 He was called to the Temple Emanu-El in New York in 1857. His successor was Dr. David Rothschild, who officiated for nearly thirty years (from 1862 till June, 1891); he died January, 1892, in Aix-la-Chapelle. Since October, 1891, Dr. Joseph Levy has been the rabbi of this congregation. Mention must be made of several members of the Belmont family, one of the oldest and most respected of the congregation. According to the Alzey"Memorial-Book," SimḦah, son of Ephraim Belmont, was the first of that name to settle in Alzey; he had been head of the Jewish community in Beckelheim, near Kreuznach, which then belonged to the Palatinate. His son Joseph Jessel, called Rabbi Jessel of Alzey, held the same position in the Alzey district; he died in 1738. These men as well as their descendants were conspicuous for their piety and for their uncommon public spirit. The Elias Simon Belmont already mentioned and his nephew Simon founded the so-called "Belmont fund," which provides a marriage-portion for poor girls. Löwenstein, Beiträge zur Gesch. d. Juden in Deutschland, 1895, i. 4, 16, 28, 51, 146, 182. In the archives of the congregation there is a "Memor-Buch."